The Frederator Studios Blog: Oh Yeah! Joe Bevilacqua & Lorie Kellog. Joe Bevilacqua is a multi-talented threat; a writer (of radio comedy and the first biography of the legendary voice actor Daws Butler), producer/reporter (for NPR), and voice actor. His wife Lorie Kellogg is no slouch either; she's a graphic designer, writer, and actor. We've all know each other for almost a decade; in fact, Joe did the internet marketing for the original shorts from Oh Yeah! Cartoons. Which is why we were thrilled when they came in to show us their ideas for the 4th season of Oh Yeah!. 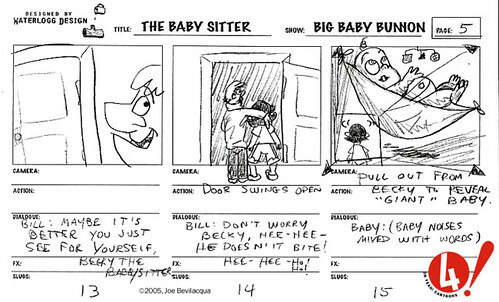 Joe's not a professional artist, but he worked hard to show us his cartoons in the storyboard form we prefer. Big Baby Bunion is the first of three we took a look at. Thanks to Joe for his kind permission to show you one of his storyboard pages.